There are numerous content errors throughout the exhibition, particularly in the way “Western” tattooing is contextualized. The notion of “Tattooing in the West” as separated out from “global” or “non-Western” indigenous tattooing is a dated and unnecessarily dichotomous concept that smacks of colonialism and a hierarchical approach to studying culture. Many of the images in the show—images presented as artifacts, not as supplementary material—are reproductions rather than originals, when originals would have been easy enough to borrow. That many of these reproductions were sourced from photography clearing houses seems scandalous from a museum-academic standpoint; this is the same material that anyone with internet access can find with a few keywords. The show privileges design aesthetics over substance to provide “experience” rather than any substantive education. Poor curatorial choices resulted in some artifacts that are only tangentially related to tattooing (with no good explanation as to why they were included) and other artifacts that pale in comparison to superior examples readily available to borrow from multiple public and/or private collections. 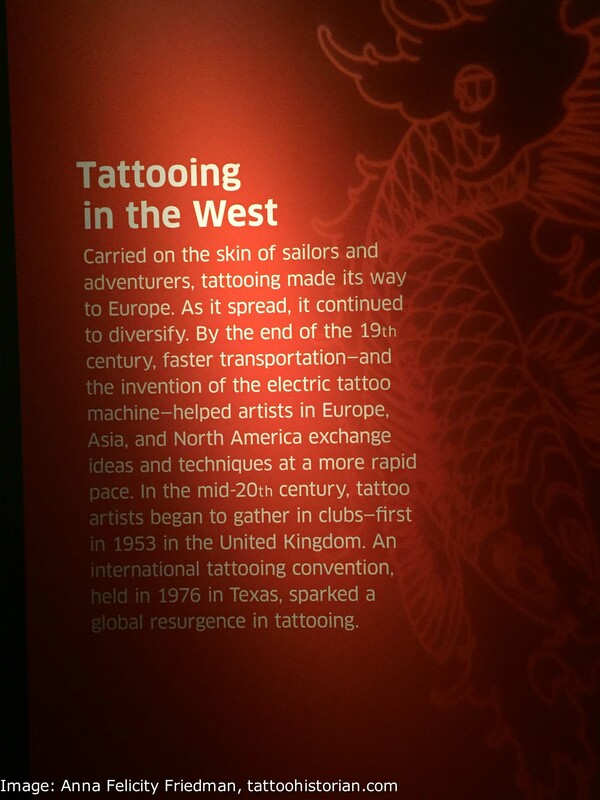 I’m not quite sure how tattooing “made its way to Europe” on the skin of sailors and adventurers when it had been present in Europe since circa 3300 BCE–long before people sailed or adventured, just one of several errors in this introductory panel to the “West” section.